BLACK EMERALD, a European Stoner/Accidental Progressive Metal Band, has been on the scene since their first EP “Isolation” dropped in 2012. Since then there was a demo and single release, as well as a lineup change. One of the band’s highlighting moments was playing the Bloodstock Open Air Festival in 2013 and having played with numerus bands over the years. The Hairy, Lairy, Kinda Scary Tour was their first in 2016 with THE FREUDIAN SESSION and MERCURY’S WELL. They are here with their first full-length release “Hell Can’t Handle All Of Us”. The album comes in with eleven tracks and a listening time of just under an hour. The opener and title track, “Hell Can’t Handle All Of Us”, comes in with a crushing depth. This is Progressive Metal at some of its most progressive. There are elements of Hard Rock, Progressive Rock, and even heavier Metals thrown in. The vocals are harsh, but clean. The bass is thick, the drums are matching the bass perfectly while also toning to an almost march sound, and the guitars offer great melody to bring us in. “Life Of Anxiety”, track two, comes in pounding. The guitar and bass are incredible, but those drums are downright sick in this opener. The guitar shreds its way through the track with a more static, crunchy play. I love how the tempo changes occur. This track is exactly how it feels to live a life of anxiety. The heartbeat, the threat, the calm-ish, the pounding, the threat; over and over and over again. The track ends much like it began. The musicianship is solid and the literal experience in this track brings it to a completely different level. Track five, “One For The Road”, has a super Bluesy element that it is so close to being a Southern Rock jam, but they slide some phenomenal Progressive flare in here for taste, and with that, it can’t be locked into just one or the other. The vocals really work perfect in this one, with his wispy and harsh, but clean approach. The drums again make for incredible music. While the drums are a highlight the guitars aren’t a far behind expelling melody at every turn. The bass is good but feels like its drowned out a bit in this one. “Sculptures To The Sky”, track eight, comes in a bit different from the other tracks and brings back more depth into the intro. It stays pretty low and subdued through its entirety. The vocals range from a screamed bark to a more guttural growl. Definitely more Metal based behind the vocals and the music. The guitars get a chance to soar in the four-minute mark but overall the track is heavy and has hints of Melodic Death Metal weaved in. The longest and what would be considered a ‘real’ Progressive track, “Jonestown”, comes in just under ten minutes. It’s true, there are some great Progressive elements here, but there is so much more. There are some Symphonic Metal undertones, some Melodic Metal love as well as your Progressive Metal needs. What an ideal track. I just wish instead of using video clips, there would have been more vocals, but I get it, the movie and this track. It makes sense. The final track, “Revelations”, transitions flawlessly from the previous track and comes in quite ethereal like. The synth heavy atmosphere is stunning and cosmic. It’s much how I would expect a revelation to occur with an instrumental music back drop. A Morse code transmission, or what sounds like one, leads us out of a very interesting and musically solid album. 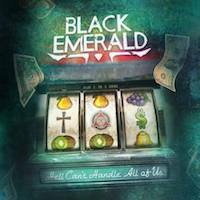 BLACK EMERALD’S “Hell Can’t Handle All Of Us” is an alluring no holds barred take on Metal. There are elements in this album that will satisfy most Metalheads and Rockers a like. The only issue is the production quality, however, being an independent and with the level of musicianship within, that is easily overlooked. If you’re looking for something new with a dose of unique, check this one out.